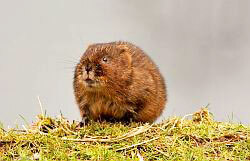 Water Voles (Ratty in the Wind and the Willows) are the largest of the British voles and have been declining in numbers and distribution over the last few years. They are now a legally protected species. In certain suitable habitats captive bred and wild caught voles are being released to establish themselves and increase in numbers. Greendale is involved in this work (as it has done previously with Sea-Eagles, Red Kite and the Galapagos project), by screening the vole’s samples, i.e. blood, faeces, before release, to insure they are healthy and disease free. We have a continuing interest and expertise in doing this kind of work in both wildlife and exotic species.